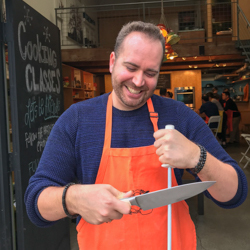 Hipcooks Bartending Teacher Adam is a USC film school grad and an LA-based writer. Therefore, he moonlights at Hipcooks! This fun & bubbly guy uses TV events as an excuse to host large cocktail-themed viewing parties. Think the Oscars, superbowl, presidential elections and more. Adam would like to script a Hipcooks Cocktail show so that he can make drinks for a viewing party, watch himself, teach cocktails and the loop will continue! As a kid on a Tennessee farm, Carrie thought the kitchen was the room you pass through to get outside. But once she left the farm & traveled the world, she woke up to food — not just as something delicious, but as a way to explore history & culture. Cooking with other people is where it's at for Christina. It reminds her of summers visiting her grandmother's farm in Romania where she and her sister would pick the evening's dinner from the garden. The girls could experiment with ingredients and they like to get crafty. Ever since coming to Hipcooks in 2007 Christina has been hooked on "Hipcooks Style" since it resonates so well with her. 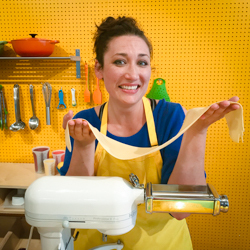 She's even recruited her sister Katie to teach at Hipcooks, too. All in the family, we say! "Start with melty cheese and a bottle of wine, and the rest will probably work itself out." 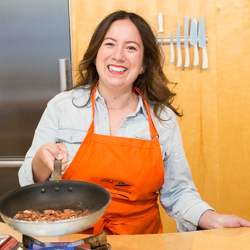 While this is a great place to start, if you're around Dani you'll want to crack that second bottle of wine because she's a Hipcook you'll want to know better. Warm and effusive, Dani has traveled (literally) the world — only Antartica remains. 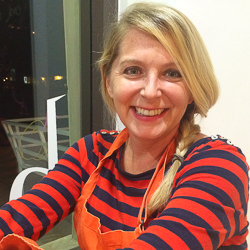 Her passion: sourcing "that perfect ingredient" from whatever style of cooking. She keeps an amazing garden with rare chili peppers from around the world and loves to find the perfect venue for each, including cocktails and desserts. Dawn learned to love winging it in the kitchen at age 10. She asked for lasagna & was told to make it herself, with no recipe provided. She's been "cooking from the hip" ever since. 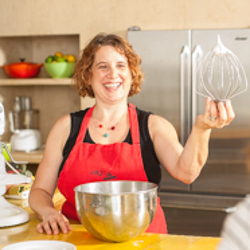 Calling all vegetarians, vegans and gluten-free folks: take a class with Dawn. She loves to modify Hipcooks dishes to accommodate everyone. No wine? No problem! Her impromptu mocktails are always a hit. 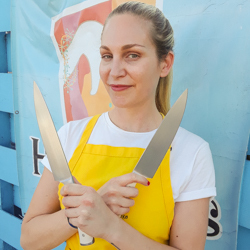 Janell moonlights at Hipcooks from her own event production company, so you can expect her to love food & be passionate about getting all the details right. She's also great at juggling 10 things at once. When not juggling, Janelle loves to have downtime with her family (& her two little kiddos) & enjoys guilty-pleasure reality TV shows. Kate began her love of food at her family farm. She canned tomatoes, plucked chickens, and picked produce fresh from the field. She became a career cook, as a line and pastry-chef at LA restaurants. Later, she tested recipes for cookbooks. 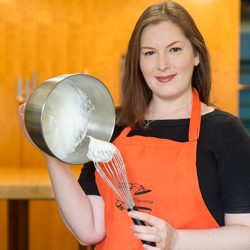 Now, in addition to teaching at Hipcooks, Kate works in food-industry brand creation and identity. It's All in the Family with Hipcooks & the Mesesans. 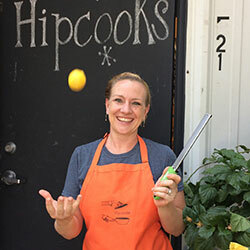 Big sis Christina has been teaching at Hipcooks since 2012, & has brought her sister aboard, too. Cooking & teaching talent runs in the blood! Katie's other passions include political advocacy & Audrey Hepburn's quote: "Let's face it, a nice creamy chocolate cake does a lot for a lot of people." Katie says: "Add a glass or two of red wine to that!" Hipcooks LA Manager & Hipcooks Regional Manager Kyrsten has been with us (her home away from home!) since 2008, though we'd argue she's a born Hipcook. Her easy-breezey, welcoming style comes from her roots, where she was raised amid the gastronomic delights of the Big Apple & the Big Easy. Whether she's spending two days crafting a feast for a special soiree, fridge-diving to whip up a delectable dinner in 15 minutes, or teaching a cooking class, she indulges her inner Hipcook with a smile & a garnish. 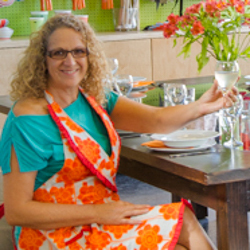 Suzana is passionate about travel, people, and cooking. In fact, she ran her own Bed & Breakfast in Brazil for international travelers. This charming Brazilian definitely knows how to be a hip-host! Creator of Hipcooks class Oh, Brazil! class, Suzana will transport you to un paiz tropical. Vivien's obsession with food began in her Mom's Brooklyn kitchen. On a shoestring budget, her mom worked magic. They kept a garden for exotic produce, like lemon verbena for spicy mango salad, lemongrass for curry, & bitter melons for soup. 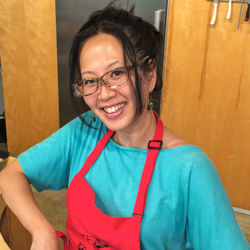 Vivien followed her Mom's footsteps & grows organic produce in Topanga for her "West meets East" cooking adventures. Her restaurant experience includes working for Andy Ricker at Pok Pok Phat. Quick-fire Phat Sii Ew, golden crispy Hoi Thawt, & Phak Buung Fai Daeng are among her favorites. Wondering what all this is? 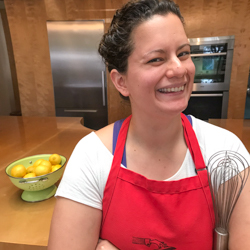 Check out a Hipcooks with Vivien & find out! © Hipcooks 2018. All rights reserved.